Dear Northern Refineries, enclosed is another shipment of platinum thermocouple wire. Enjoyed friendly and honest service with my last platinum shipment. Thank you. Our industry utilizes large groups of the thermocouple wire, which is composed of very high grade platinum and other precious metals like rhodium. 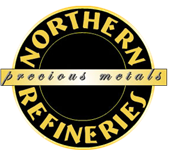 Refining services provided by Northern Refineries have far surpassed any other precious metal refining company we have ever used. We are a jewelry manufacturing company that uses gold, silver and platinum in our industry. It has truly been a rewarding experience to have finally found a full service precious metal refining company that fulfills all our refining needs. We are a machine and tool shop that utilizes silver scrap. Our company has been dealing with Northern Refineries for over 5 years. Your refinery processed and refined our silver flake. You recovered more silver with your up-to-date state-of-the-art refining system. Thank you and keep up the excellent work. A great job. I sent in my precious metal scrap to be refined and returned in pure gold and pure platinum bullion. You gave me honest replies to all my questions about recovering, refining and assaying all my gold, silver and platinum precious metals. Another shipment is on the way. Thank you.